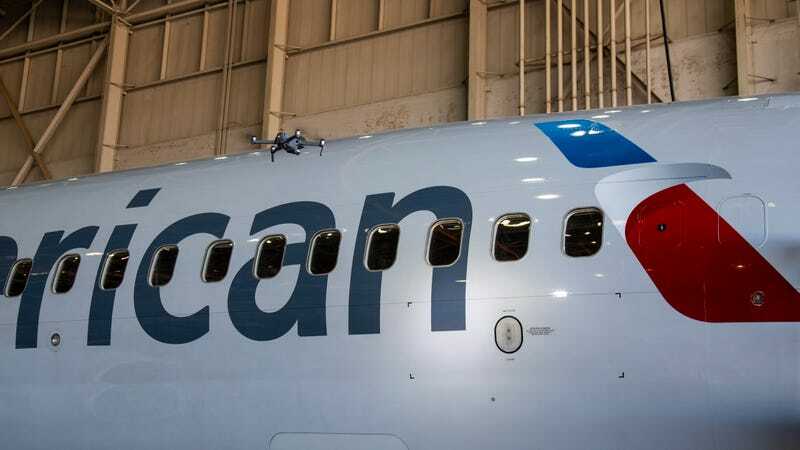 It was a cool day in Dallas last November, when a small quadcopter lifted itself off the ground of an American Airlines hangar and buzzed towards a Boeing 777. The drone, a DJI Mavic Enterprise, had been outfitted with a spotlight, but otherwise looked a lot like what you might see your neighbour flying in the backyard. The remarkable difference was that this particular aircraft had been programmed to inspect the hull of the much larger aircraft, the jet. It could do in a matter of minutes what it would take a maintenance crew hours to do. It was, in its own way, a tiny flying robot with a job. A small gaggle of journalists watched the drone slowly make its way around the aeroplane, spotting specially located indicators that resembled bullseyes on the fuselage and sending alerts back to a pilot. This was just a demo, though. The drone had been programmed to spot the innocent-seeming bullseyes, but the airline says it could just as easily spot damage. Currently, American and other airlines employ a group of workers on a cherrypicker to inspect aircraft between flights, but some think that drones could do the job just as well – or at the very least, drones could help streamline the process. That is, if the airline decides to make the demo a part of everyday operations. “This is a tool of the future that should be in every professional technician’s toolbox,” said Lorne Cass, American Airline’s VP of Operations and Industry Affairs, who went on to say that drones could also be used for all kinds of things, like spotting debris on runways. That might be a tall order, if only because it’s incredibly problematic to fly quadcopters around airports. (Just ask the folks at Gatwick Airport.) There’s also the stigma surrounding unmanned aerial vehicles that refuses to go away. A lot of people don’t like drones. Flying robots with increasingly powerful cameras and a growing number of tools sounds like the scariest parts of the dystopian future we were warned about. But as is often the case with emerging technology, there’s another story to tell. Outside of the stunts and spectacles, a growing number of drones are doing work. Some of them are doing police work, which is potentially scary, but the vast majority of enterprise applications for drones is refreshingly positive. The rise of commercial drones has long been predicted, but it’s actually happening now. Companies like American Airlines and Union Pacific are experimenting with using drones in their daily operations. Meanwhile, state and local officials are finding ways that these aircraft can do things like streamline public works projects and help firefighters with search and rescue operations. Heck, even farmers have drones to watch their crops. So you have to wonder: Will drones ever be good? Or at least, will people ever stop perceiving them as evil? The optimist would say that drones are already proving themselves to be much more than war machines or annoying toys. Drones also don’t need to perform headline-grabbing feats like delivering Amazon packages or dropping medicine into the jungle to be good for the world. They just need to do basic, boring stuff. You know, chores. It’s not as exciting as spying, but the most useful thing drones are doing these days is inspecting things. Putting a camera or sensor in the air allows you to fly it around hard-to-reach places, like the top of a Boeing 777. Meanwhile, increasingly powerful software can crunch terabytes of data efficiently enough to create so-called digital twins of physical spaces, like a bridge or a factory. 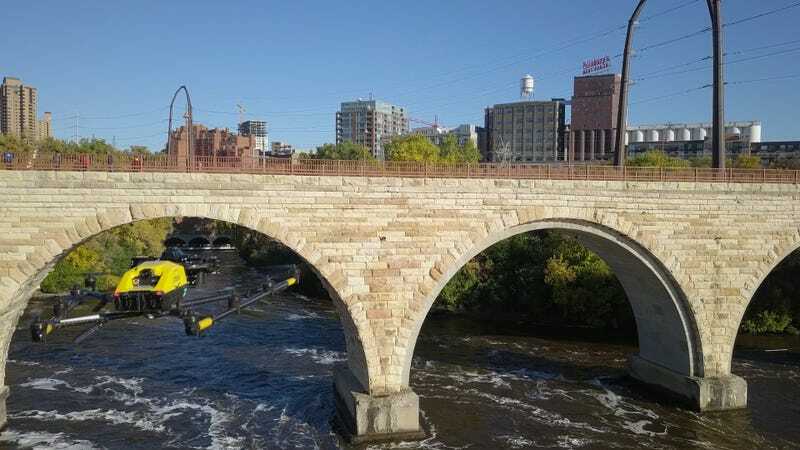 Intel has been particularly focused on inspection drones for the past couple of years, and the company recently announced a new study that sent octocopters to inspect bridges in Cincinnati, Ohio and Minneapolis, Minnesota. These inspections involve an automated drone flight, during which a 36-megapixel Sony Alpha 7R camera takes hundreds of photos of the bridge. These photos are then stitched together to create a 3D model of the bridge with enough resolution to see even the slightest flaws in the structure. Once that digital twin is created, the inspectors can compare it to data captured on future flights to see how the bridge is changing. The sheer efficiency of using drones like this is a huge leap forward for jobs like this. Improving bridge inspections isn’t just about preventing traffic jams, either. Much like a drone spotting damage on an aeroplane, this is a potentially life-saving innovation. According to the American Society of Civil Engineers, over nine per cent of America’s bridges are structurally deficient, and since nearly four in ten bridges are over 50 years old, that number could increase as the infrastructure continues to age. At the same time, the current methods for doing inspections are limited and time-consuming. Inspectors can’t always access every part of the structure, and, problems can be overlooked. If nothing else, data collection is sometimes inconsistent. Drones are uniquely equipped to solve some of these problems. The repeatable inspection workflow they can perform captures the same detailed images again and again. That means inspectors can see how the bridges or other infrastructure change over time. Considering the sorry state of America’s infrastructure, the need for more detailed inspections spans beyond bridges to roads, electrical grids, and pipelines. In some cases, drones can do the work better and faster than people can. That doesn’t mean we’ll be depending solely on robots to spot cracks in our Interstate system any time soon. They might help us get better at the task, though. The basic idea of automated aerial imaging goes beyond infrastructure. Drones are also proving themselves to be valuable in disaster scenarios. A squadron of unmanned aircraft descended on the area around Paradise, California last November, after the state’s largest wildfire ravaged the area killing at least 86 people and burning over 20,000 structures. In just two days, 16 teams of Northern California emergency responder agencies ended up conducting 518 flights to map 17,000 acres of the affected area and survey the damage caused by the Camp Fire. It’s been called the biggest drone response to a disaster in American history. Romeo Durscher, DJI’s director of public safety integration, was on the ground in Paradise and says that the aerial imagery captured during the fire represents the largest map ever created by multi-rotor aircraft. To do so, the teams involved used Phantom 4 drones flying at an altitude of 300 feet, which was a challenge since some of the firefighting aircraft were flying as low as 500 feet. Meanwhile, organising the data and getting it online quickly was also a daunting task, especially since connectivity was minimal during the fire. The emergency responders hand-carried SD cards to San Francisco to upload the data to servers to create useful maps in the hours and days after the drone flights. In addition to local officials planning for recovery efforts, the victims of the fire were some of the first to see these maps. It was pretty simple, actually. Once the drone-wielding first responders got the aerial images organised onto a map that victims could access online, people could see the damage. In other wildfire events, it could be days or weeks before victims could know if they had a home to return to. For their part, local officials couldn’t start rebuilding efforts without knowing what got destroyed. Thanks to the drones, everyone could start planning for the future before the fire had even been contained. This is only the beginning of drones playing a role in disaster recovery. The same aerial imagery techniques could be deployed in the event of an earthquake, a tornado, or a hurricane. In fact, it’s already happening. A growing number of companies are working with the Federal Aviation Administration (FAA) to provide drone-based disaster relief, and the use of unmanned aircraft is becoming increasingly common in local fire and police departments. The New York Police Department even has a fleet of drones for “tactical operations” now. DJI, for one, is banking on the idea that drones can help in an emergency. The same Mavic Enterprise drone that made an appearance at the American Airlines hangar in Dallas a few weeks ago is being marketed to search and rescue crews who could use available accessories like the spotlight or loudspeaker on a variety of missions. The company has gone so far as to participate in studies about how drones can find missing persons more quickly than human teams. It makes perfect sense. An eye in the sky is always an asset when looking for people, and it’s a lot more positive if those people are lost rather than, say, being hunted by the military. 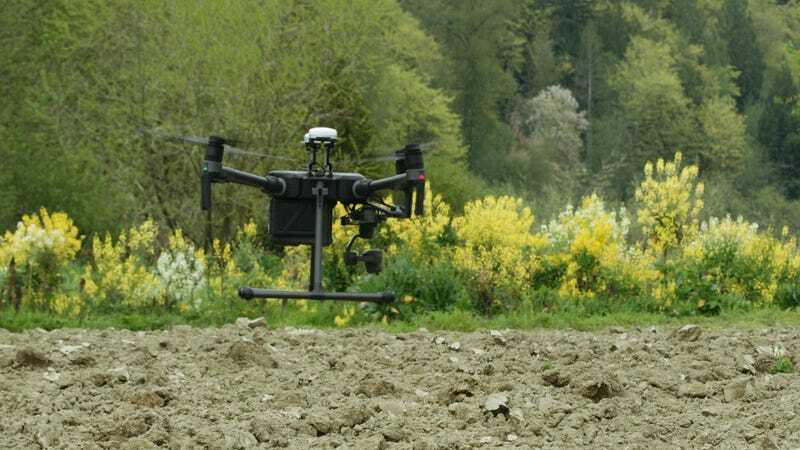 So if drones can find cracks in bridges and detail destruction in a disaster, it shouldn’t come as a surprise that they can spot fertile soil on a farm. At least that’s what Bill Gates believes. Last fall, the former computer geek and current philanthropist visited Dancing Crow Farms in Washington, a pilot site for a Microsoft Research project called FarmBeats that uses drones and other emerging technologies to give farmers an extraordinary amount of data about what’s happening with their land. The classic concept for accomplishing this involves installing soil sensors that can measure temperature, moisture, and pH levels. The problem is that these sensors are expensive, sometimes costing several hundred dollars a piece only to cover a few square meters of land. Typically these sensors would also depend on prohibitively expensive, custom-built cellular base stations for connectivity, but the Microsoft project hopes to extend the range of these sensors cheaply by using unoccupied portions of the old UHF and VHF radio frequencies to transmit large amounts of data using old school TV antennas. It also employs drones to collect aerial imagery, including details about pests and crop health. Once all of this data is collected, farmers can eventually use a laptop and machine learning software built by Microsoft (obviously) to combine the aerial imagery with the sensor data to provide a more complex picture of what’s happening with the land. And thanks to the magic of machine learning, even short drone flights over particular parcels of land could offer insight into the condition of the entire farm. Sometimes, the drone flights are simply scouting missions. Stratman went on to explain that the FarmBeats program helps him to see which of his crops do better on certain areas of the farm and to decide when to plant certain crops. Combined with the sensor data, the drone imagery creates heat maps that illustrate soil conditions, and Stratman says the maps are helping him predict the movement of microclimates on his farm. Better understanding the soil and how the weather affects it ultimately leads to better crop yields. Of course, thanks to its role in the Microsoft research, Dancing Crow Farms is unique in the agriculture world. FarmBeats is still just a research project, although Microsoft says it’s looking at ways to expand its reach. But at the end of the day, even the basic idea of integrating drones and aerial imagery into life on a farm could be extremely powerful. Maybe that’s the best way to think about the good that drones can do in the world. They’re tools that take us places and let us see things we couldn’t have otherwise seen. As with other new technologies, drones pose a threat to existing workforces, but the work of drones can be largely complementary. Whether that means helping farmers check on crops or firefighters find a missing person or mechanics spot damage on an aeroplane, we can do things with drones we couldn’t do before. Just because the robots haven’t taken all of our jobs yet, doesn’t mean they won’t. Sceptics are right to point out that flying robots also pose a unique threat. The fact that drones are becoming an essential tool for law enforcement – a tool that could be misused or even abused – cannot be ignored. For instance, DJI recently teamed up with Axon, the Taser and body cam manufacturer, to sell drone technology to police departments. (Shortly after the partnership was announced, the NYPD rolled out its new fleet of DJI tactical drones.) Meanwhile, Axon is building up computer vision startups and has taken meetings with facial recognition technology companies. There’s a real possibility that drones installed for perfectly innocent and even altruistic reasons will end up getting used for surveillance or worse once in place. Even as we get our helper drones, the technology will concurrently become more menacing in the future. Other, broader issues abound. For privacy advocates, the very notion of an airborne camera also means that some people will want to keep their windows covered and their kids indoors, though incidents of peeping drones still seem few and far between. Security hawks will warn that consumer drones can be retrofitted to carry and drop bombs. So far this technology has so far only been reported in conflict zones. Air safety experts will also point to the chaos recently unleashed at Gatwick Airport near London, where mysterious drones flying near the runways led to hundreds of cancelled flights. The FAA, for one, is taking steps to mitigate the anxiety towards and negative effects of unidentified drones. The agency just announced a new test programme for the remote identification of drones. This concept would assign a sort of virtual license plate for the aircraft that authorities could use to identify and track drones. This would not only help civilians feel like there’s a pilot accountable for that random quadcopter hovering near their homes but also aid commercial drone operators in securing proper clearance for certain missions. Before long, technology like this might help the drones themselves communicate with each other in midair and even cooperate on projects. A future that includes autonomous swarms of drones working together to help fix bridges or grow crops still seems several years off, however. For now, we’re left with experiments and research projects to showcase the potential good that drones can do as well as to illustrate how the proliferation of unmanned aerial vehicles are hardly just a threat. If all else fails, if we find out that drones make cumbersome inspectors or crappy farmers, there is an undeniable backup plan: Drones make damn good entertainers.